In a cost-saving computer modelling effort, the National Energy Technology Laboratory (NETL) assisted in solving a critical technical issue at the U.S. Department of Energy (DOE) Office of Environmental Management (EM) Integrated Waste Treatment Unit (IWTU), preventing a long-term delay of start-up operations. IWTU is an Energy Department facility designed to treat 900 000 gal. of radioactive liquid waste by heating and essentially drying it into a solid granular material for long-term storage. The heat required in this process is created by a piece of equipment called a denitration mineralisation reformer (DMR), in which coal, steam, air and oxygen interact. Because this mixture contains multiple phases of matter (i.e., solids and gases), an understanding of multiphase flow is critical for design and troubleshooting. Using the Lab’s Multiphase Flow with Interphase eXchanges (MFiX) software suite, NETL researchers demonstrated that the problem — solids accumulating or agglomerating in the lower regions of the DMR — was inherent to the DMR’s design and could not be overcome under normal operating conditions. “Once we figured out the reason for the problem, we realised that the reactor would need to be redesigned,” said Guenther. NETL researchers then began a highly successful collaboration with EM support contractor Flour Idaho and the Idaho National Laboratory to create MFiX simulations that screened three alternative reactor designs under a range of conditions. This partnership was an exceptional example of teamwork in which a DOE contractor leveraged a variety of powerful resources, including cutting-edge modelling tools, the expertise of two national labs and thousands of computational cores on NETL’s super computer Joule, to efficiently solve a difficult technical issue. The team created exceptional value, as the task was accomplished with only two full-time employees working for 8 months on the modelling effort. The simulations were pivotal in the design selection and guided both sub-scale and full-scale experiments. This computational approach eliminated the need to test each design under a range of operating conditions at full scale, saving tens of millions of dollars in the design phase alone. IWTU made the selected design change to the DMR, which was successfully tested with no evidence of further accumulation of solids. 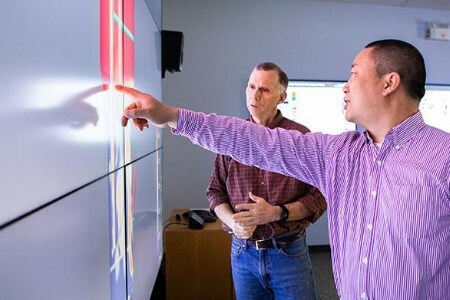 This is just one example of how NETL’s computational modelling efforts are working to not only better predict and optimise the performance of fossil fuel power generating systems but are also finding new applications throughout DOE.